Thrift Store Find: Pentax K1000 with a 28-70mm Zoom Lens. This is a thrift store find. It's a Pentax K1000 with a 28-70mm zoom lens (f/3.4-4.5). The lens has no identification other than it's specs so I'm it is probably not an original Pentax lens. I will have to do a little research. Other than a few dings on the filter mount ring, it's in good condition and seems to be fully operational. It came without a lens cap, so the battery was dead. The Pentax K1000 has no on-off switch for the light meter. It turns "off" when you put the lens cap back on. Testing the battery on the Pentax K1000 isn't obvious. There is no switch or button. To test the battery, set the ISO-ASA setting on the dial to 100. Set the shutter speed dial to B (bulb setting). Look through the viewfinder and look at the light meter needle on the right side. If the needle is in the up position and steady, the battery is good. If it is not, then replace the battery. The camera uses a 1.5v SR44 silver oxide battery or an equivalent. The LR44 battery is cheaper, but I don't recommend them, because they may leak and damage your equipment. I figure spending a little more money on the silver oxide battery is the better investment, because they last much longer than the alkalines and are lower risk for damaging the camera. The battery compartment is on the bottom of the camera. I first became aware of the practice of flipping lens on simple single lensed cameras when I saw samples of a flipped lens Brownie Hawkeye at Flickr.com. The images showed exaggerated blurring and vignetting on the edges. These looked similar to Holga and Diana camera images and I was intrigued. 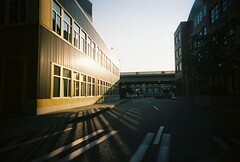 I recently saw samples of a flipped lens Ansco Pix Panorama and was inspired to give it a try. When I went looking for my Pix Panorama, I found I had 2. I knew that this was a perfect way of comparing a stock camera to one with a flipped lens. These images are clickable for higher res images. Would you like to try this yourself? I made a how-to video showing how to flip the lens on the Ansco Pix Panorama and posted it on my youtube channel. I saw this plasticky SLR at my local camera store. A real SLR with a 40mm f/2.8 fixed lens, which has markings that say "Great Wall", perhaps referring to the grandaddy of all toy cameras, the maker of the original Diana camera? It costs about $45. Has anyone tried one of these yet? I looked on Flickr, but there aren't any images taken with this camera. If you've sighted one of these in the wild, let me know. You can shoot with or with out image in the sprocket hole area of the film. A special non-racheted film advance system, so you can wind BACKWARDS as well as forwards. This means you can back up on a roll to create some interesting double or multiple exposure images. It can shoot with or without exposed sprockets, via a removable mask. While it shoots with standard 35mm film, the negatives are extra wide, so most labs will be able to process the film, but won't be able to scan or make prints. You will have to scan them in yourself, or send them out to a lab that will work with it. I haven't tried them yet, but thedarkroom.com works with most types of lo-fi camera film, including 120 film and 35mm film from DIY Holga120 and the Sprocket Rocket. Early evening at the Adobe building in Fremont. Vivitar Ultra Wide and Slim, on Fuji Pro 400 H.